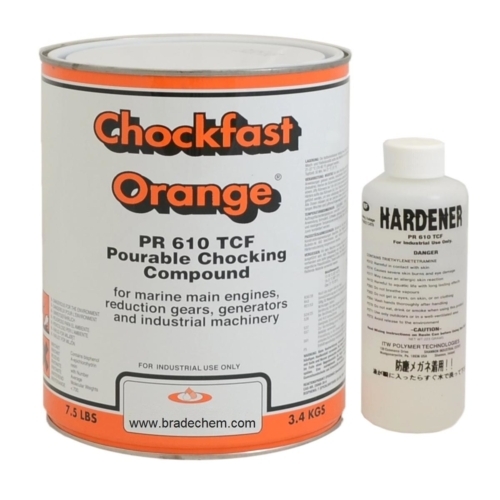 CHOCKFAST ORANGE (PR-610TCF) is a specially formulated 100% solids, two component inert filled casting compound developed for use as a chocking comound or potting material. 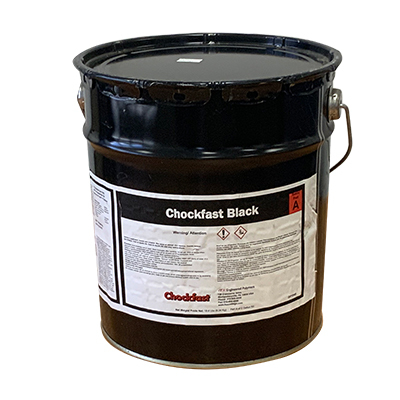 CHOCKFAST is designed to withstand severe marine and industrial environments involving a high degree of both physical and thermal shock. 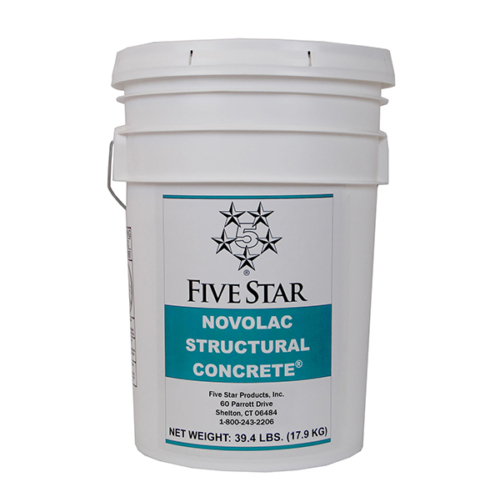 The compound is non-shrinking and has very high impact and compressive strength. 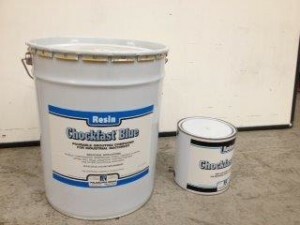 The Chockfast Orange is designed to be applied in various ambient temperatures with controlled exotherm temperatures. CHOCKFAST ORANGE was developed as a chocking or grouting compound for use under marine main propulsion machinery in depths of ?? to 4? (12mm to 100mm). 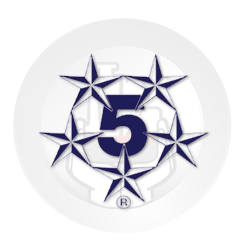 The compound is used under diesel and gas engines, reduction gears, generators, compressors, pumps, precision bearing blocks, crane rails, and numerous other applications. Characteristics: - High physical compressive strengths - Very high impact strengths - Designed to withstand a high degree of both physical and thermal shock - Will hold very tight tolerances for precise maintenance of machinery alignment - Approved or accepted for its intended marine use by American Bureau of Shipping, Lloyd's Register, Bureau Veritas, Det Norske Veritas, Germanischer Lloyd and most other major regulatory agencies worldwide. 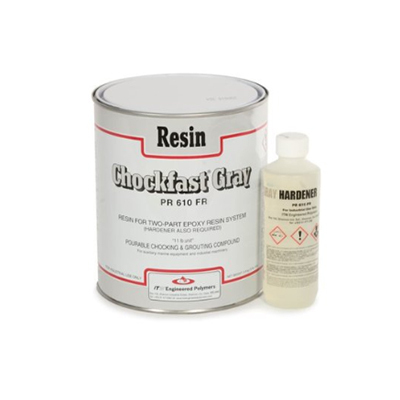 - Very flowable material (Can be injected under baseplates @ 1/8" gap) - Simple mixing & application without the need for special tooling - Excellent for filling voids and conforming to all irregularities for a perfectly fitted chock. 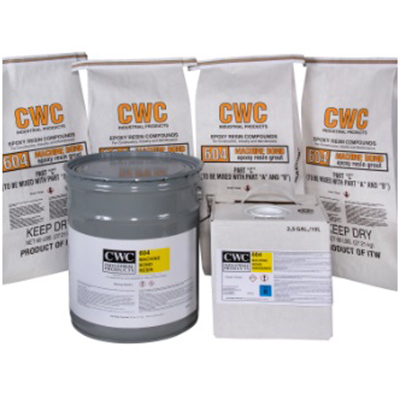 - Packaging (1 Gallon Kit ) Coverage - 120 Cu.In (2.5 Gallon Kit) Coverage - 260 Cu. In. 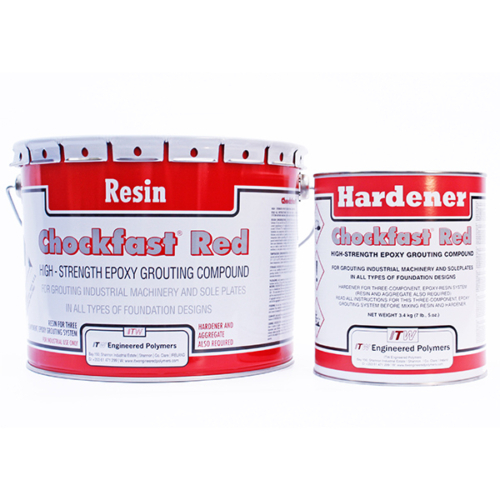 CHOCKFAST RED SG is a three component, high strength, 100% solids epoxy grouting compound which is used to grout large machinery and to support soleplates in all types of foundation designs with clearances as little as 1" (25mm). 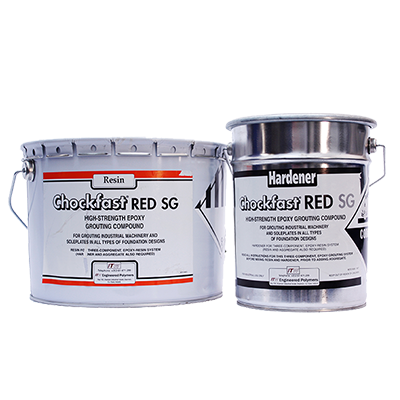 CHOCKFAST RED SG has extremely high physical properties and negligible shrinkage, making it ideal for final positioning of critically aligned equipment within close tolerances. Skid mounted compressors, extruders, turbines, pumps, motors and crane rails are just a few types of equipment supported on CHOCKFAST RED SG. 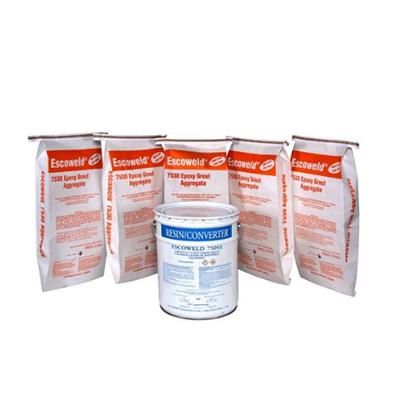 Characteristics: - Exellent flowability - Impervious to oil and chemical attack - Cures at least ten times as quickly as compared to a cement grout - Pre-packaged unit - Grout machinery in final aligned position - Higher physical strengths - High dimensional stability and resistance to creep and vibration - Strong bond to metal and concrete - Unaffected by weathering and freeze/thaw cycling - Superior resistance to fatigue - Packaging (1.6 Cu. Ft. Kit ) Coverage - 2,765 Cu.In CHOCKFAST RED SG contains no non-reactive diluents which could interfere with the curing mechanism or which could cause material loss during or after cure. Machinery may be positioned at its final elevation before pouring because the shrinkage is negligible. Critical alignments are maintained during machinery operation due to CHOCKFAST RED SG's high dimensional stability and resistance to creep and vibration. Provide a high coefficient of friction to help hold engines down tight. 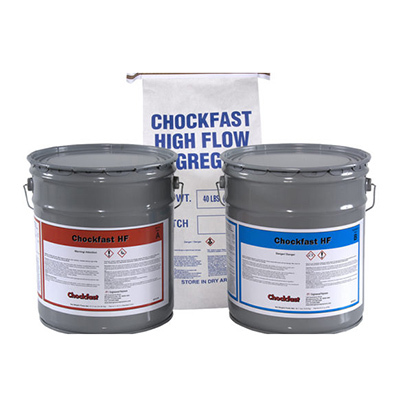 The excellent flow-ability of CHOCKFAST® Black allows it to fill voids in the chock area and conform to all surface irregularities. 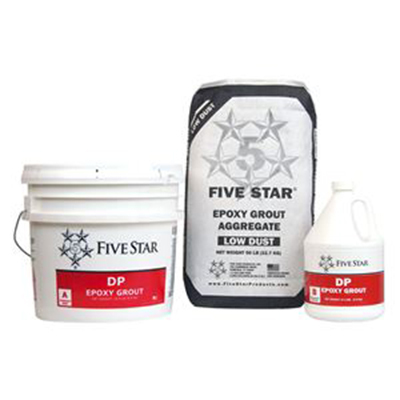 Five Star DP Epoxy Grout is the only expansive, non-shrink, low exothermic epoxy system for machinery grouting. This versatile, dual purpose product is formulated for single, large volume placements and may be used as thin as 1/2 inch (13 mm) in depth. 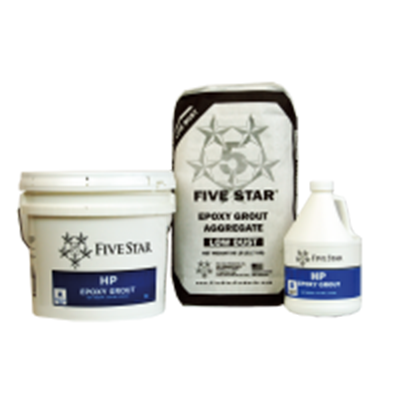 Five Star DP Epoxy Grout is a three component, 100% solids, solvent-free system formulated to provide high-strength and superior creep resistance combined with the highest effective bearing area. 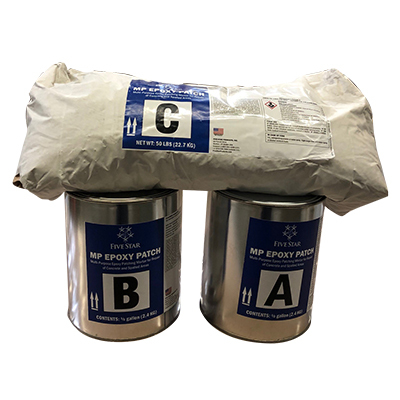 Five Star DP Epoxy Grout exhibits positive expansion when tested in accordance with ASTM C 827. Characteristics: - Deep pour capabilities 1" to 18" - Good working time - Solvent-free cleanup - Adjustable flow for various conditions (Standard 5 Bag Mix or High Flow 4 Bag Mix) - Expansive, non-shrink per ASTM C 827 - Superior creep resistance - Chemically resistant - 95% effective bearing area (EBA) when following proper grouting procedures - Excellent adhesion to steel - Packaging Single Sack (.5 Cu. Ft. Kit ) Coverage - 864 Cu.In - Full Unit (2.0 Cu. Ft Kit) Coverage - 3,456 Cu. In. - High Flow Kit (1.79 Cu Ft. Kit) Coverage - 3,093 Cu. In. 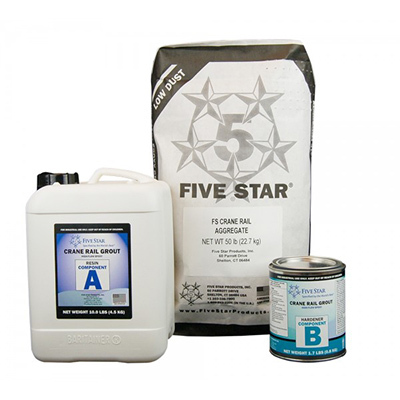 Five Star Fluid Epoxy is a two component, all-purpose, rapid cure, fluid epoxy system. 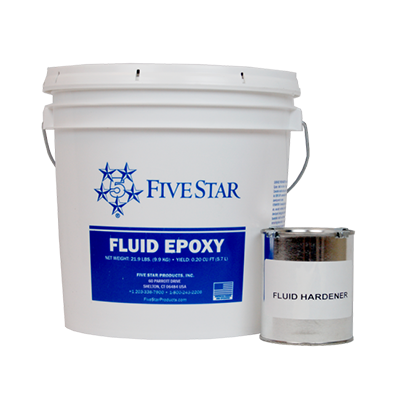 Five Star Fluid Epoxy is designed for adhesive grouting, anchoring, repair of spalls and cracks, skid resistant surfaces and setting of bolts and wedges. 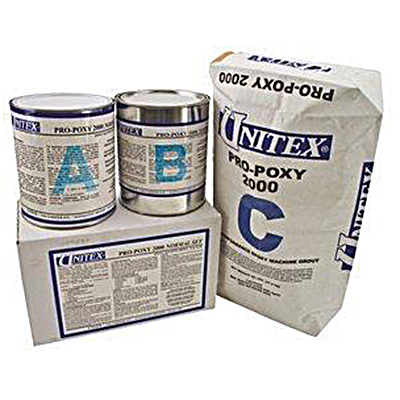 Characteristics: - High early strengths - Fluid consistancy, self leveling - Good impact resistance - Excellent for repeated dynamic loads - Chemically resistant - Excellent adhesion to steel and concrete substrates - Packaging (.20 Cu. Ft. Kit) Coverage - 345 CU. In.